Delightful shrubby variety of Japanese Maple. The new growth of bright red/pink becomes darker red towards in Summer and then bronze green,clear red Autumn colour. Neat,compact habit to 1.5 metres. Japanese Maple. Very striking recent introduction,new growth is orange becoming bright yellow through summer. In Autumn the foliage changes again to orange and bright red shades. Height to 2 metres. Fascinating variegated effect,this Japanese Maple has leaves flecked strongly with pink,cream and green. Medium grower to 2 metres. Japanese Maple. Neatly shaped small tree of good vigour.Superb autumn colour,perhaps the best of any tree.Height to 4 metres. Wonderful Japanese maple of open,compact,spreading habit. The new growth in Spring is bright pink/red becoming darker red towards Summer. In the Autumn the leaves turn clear red before dropping. A lovely small tree giving abundant white flowers against newly emerging bronze/pink young growth in April/May. Also provides excellent Autumn foliage colour of bright orange/red. Fascinating woody based perennial having stipules on the stem veined deep purple-red. The pea-like yellow flowers are borne from late Summer into Autumn.Quite hardy in spite of its tropical appearance. 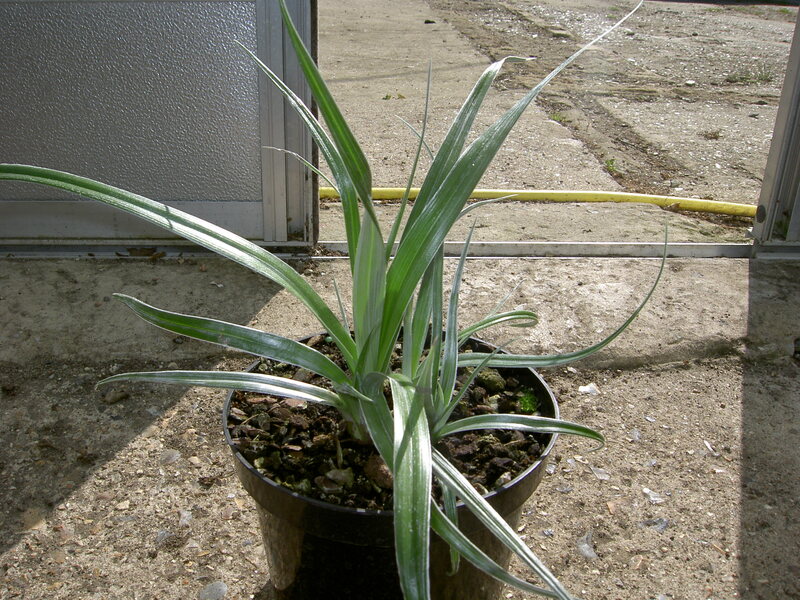 Glossy silver sword-shaped leaves are the attraction of this plant,a great accent plant for patio or border. Deciduous shrub,neat and quite compact habit. The foliage is bright golden-yellow throughout Summer making a strong feature in the garden. Before leaf fall the foliage colour becomes bright orange-red. Wonderful in flower this evergreen Berberis has a profusion of large pendulous racemes of golden-yellow flowers in spring. Glossy green foliage and a height perhps over 2 metres. A lovely large shrub or can be trained as a small tree. The long pendulous racemes of mauve flowers are borne in profusion in June and July and make a spectacular display. 'Butterfly Bush'. Long racemes of scented deep purple flowers.Strong growing shrub 2-3 metres. 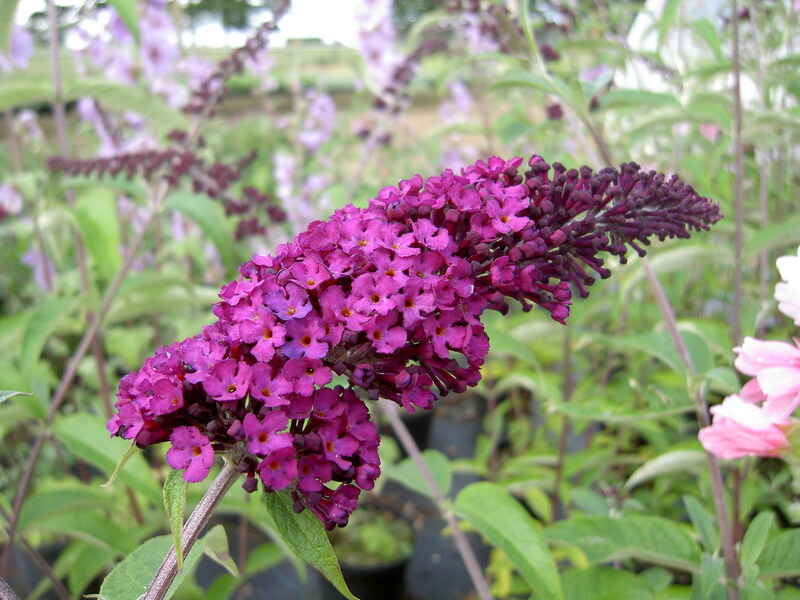 'Butterfly Bush'. Huge racemes of rich pink flowers over a long period in summer.Very eye-catching vigorous shrub 2-3 metres. 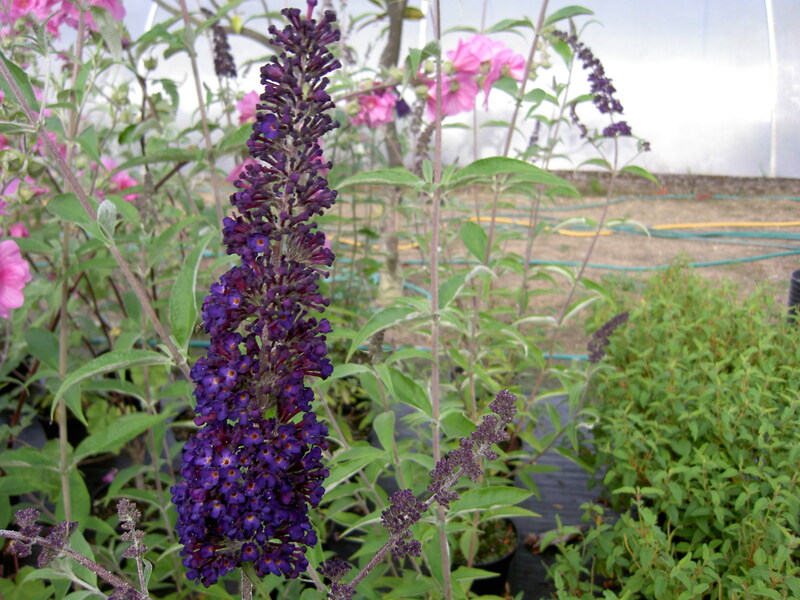 'Butterfly Bush'. Long racemes of scented red flowers over a long period in summer.Vigorous shrub 2-3 metres. Interesting Buddleia having racemes of orange flowers over a long period in summer.Vigorous shrub 2-3 metres.